On the eve of the 12th anniversary of the September 11 terrorist attacks, IAM-represented Flight Attendants joined the Flight Attendant Union Coalition to request that members of Congress make voluntary personal contributions to close a $1.5 million funding gap for the Flight 93 National Memorial. Flight Attendants distributed a letter to every member of Congress asking that they set an example by making a personal contribution toward funding the memorial’s Tower of Voices and educational programs. In 2002, Congress authorized the creation of a national memorial in Shanksville, PA to honor the Flight 93 crewmembers and passengers who gave their lives to prevent an attack on the U.S. Capitol. This national memorial, marking the final resting place of the 40 heroes of Flight 93, is a permanent tribute to those aboard whose incredible acts of bravery saved countless lives at the cost of their own. It is the only national park commemorating the events of September 11, 2001. Click here to visit to park’s website. 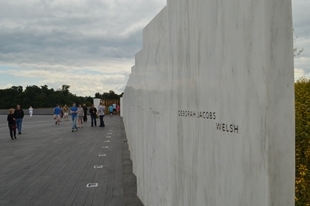 The Flight 93 National Memorial officially opened to the public on September 10, 2011, but still needs to meet its ultimate fundraising goal in order to be completed. The Coalition of Flight Attendant Unions coordinates on issues of mutual interest to Flight Attendants. Members of the Coalition include the IAM, the Association of Flight Attendants-CWA, the Association of Professional Flight Attendants and the Transport Workers Union.